The objective of Playtech Hi Lo is to predict the winning card of the game round. 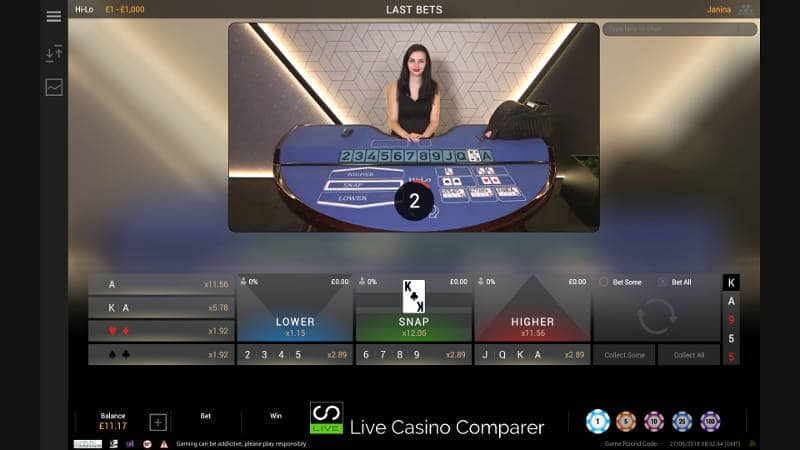 It’s one of the easiest games to understand and play with live dealer. The basic bets are for the next card being Higher, Lower or the Same as the previous card. The game is played with 6 decks of 52 playing cards. Aces are treated as high cards. An unlimited number of players can play in a game round. The cards are dealt by a Live Dealer. With card games like Dragon/Tiger or Baccarat, you bet blind, i.e you don’t get to see the cards before you bet. The beauty with High Lo is you see the card you have to beat before making your betting decision. It’s for this reason that payouts are lower, but in my opinion doesn’t make the game any easier to play. You can see the result of my random playing session in the video above to see what I mean. On the table is a grid displaying the card values 2 through to the Ace. One will be highlighted, this is card value that you are betting against. You have to decide whether the next card dealt will be higher, lower or the same as the card being displayed. The dealer takes the first three cards from the shoe and “burns” or discards them. The next card dealt is in play and compared to what’s on the table. The bets are settled. The dealer then replaces the original card on the table with the one just dealt and the next game round begins. The betting options are configurable by the operator, so it’s quite possible that you’ll come across Playtech live casinos that have restricted the number of bets you can make at one time. The most restricted is Single Betting, where you’re only able to bet on one position. With Multiple Betting switched on you’re able to bet on multiple positions at the same time. This provides the most flexibility so it’s possible to hedge your bets with this mode enabled. Higher (Payout is adjusted) – the Next Card will be higher than the last. Lower (Payout is adjusted) – the next card will be lower than the last. Snap (12.06:1) – The next card will be the same as the last card. Ace (11.56:1) – The next card will be an Ace. Ace/King (5.78:1) – An Ace or King will be the next card. Red (1.92:1) – The next card will be Red. Black (1.92:1) – The next card will be Black. 2/3/4/5 (2.89:1) – the next card will be one of these. 6/7/8/9 (2.89:1) – A mid card will dealt. J/Q/K/A (2.89:1) – A high card will be dealt. Payout values for the Lower & Higher bets are calculated after the next card is known. The payout is generally smaller than even money if you stand a good chance of winning. The other bets have more static payouts. What Happens when you Win! I know that sounds stupid, but if you win a game round you need to understand what happens to your winnings. When you win, the money is moved to the Stake Position to the right of the betting positions. You can choose to Collect All the money, which will transfer it back to your bankroll. Or Collect Some, which will move about 10% back to your bank roll. If you leave some or all of your money in the stake position, when you click on a betting position it will move it all there. My preference is to Collect All each time. I can’t really see the benefit of leaving it in the Stake position. The playing interface can be displayed in two modes. Which one you get is determined by the quality of the internet connection or by selection through the settings. It’s possible to over ride the default setting, but I wouldn’t bother as you’ll get a better playing experience sticking with what’s chosen for you. Everything is laid out quite simply in the playing interfaces. Basic adjustments to the video and sound can be made through the Settings menu. It’s also possible to see the hand history and also make deposits from the interface. Android and iOS device users will be pleased to hear that Playtech Live Hi Lo can be played on mobile devices. The interface is very good. 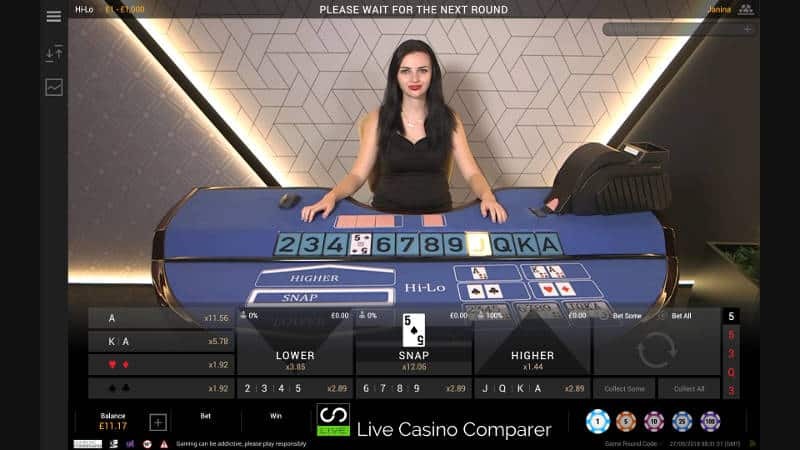 Playtech Hi Lo is the only live dealer version on the market. It’s a simple game, but don’t let that fool you into thinking you’ll always win, because you won’t. The playing interface is nice and if you play at a casino that has all options enabled you should be able to bet smartly. As far as I know there is no defined Strategy for playing Hi Lo. The use of the Shufflemaster dealing shoe, makes it impossible to card count as does the burning of the first 3 cards on each game round. Your best bet is to work on probabilities and gut feel.